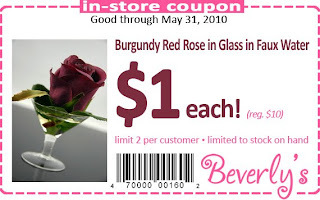 Receive a beautiful burgundy red rose in an elegant glass of faux water for just a dollar when you print our new May coupon and bring with you on your next visit to your local Beverly's store. Expires May 31. We hope to see you soon!